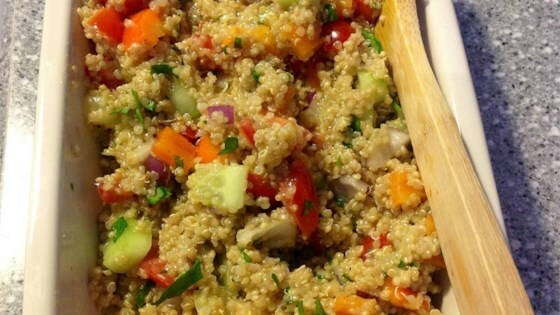 "Quinoa with various veggies and a zesty (and easy) vinaigrette that makes a wonderful salad dressing for any salad. I used one English cucumber instead of 2 normal cucumbers because we prefer the taste. Cook the quinoa with the water as you would normal rice (works in a rice cooker as well)." A little dry for my tastes, i usually cook the quinoa in more water, and I would definitely up the veggie ratio in the future to make it more salad-like. Otherwise decently tasty. Excellent salad! I'm always looking for gluten free recipes and this is one of the best. I loved the dressing so I added extra. Taking it to a potluck at work today!